The initiators of Pictar were certainly annoyed, as LG has introduced with the CAM Plus for LG5 a camera-grip for the smartphone. 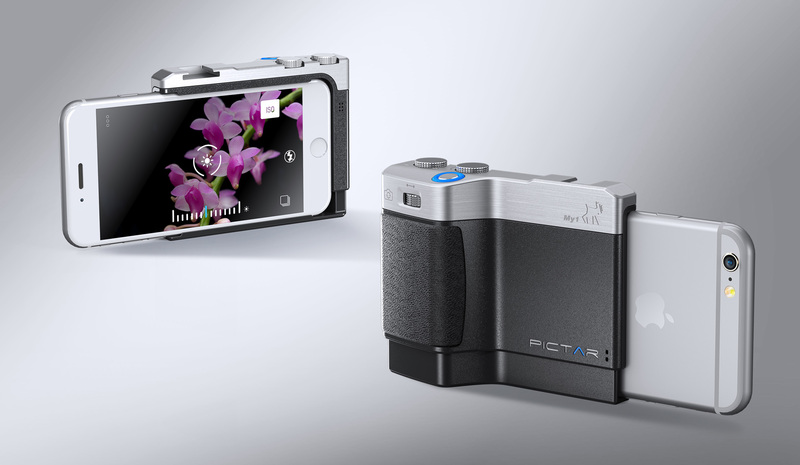 But that’s not as worse as it’s sounds because the Pictar is a camera grip exclusive for the iPhone. Different target group, no problem. Good for mymiggo.com, the creator of pictar is also that the CAM Plus grip of LG is still very restricted in his ability. It has only a dial and a timer. Pictar is way more versatile. But nevertheless let’s take a look at the shutter release button at first. This can be half pressed like a real camera. So after you’ve find the focus, half press the button and then move the picture while keeping the focus. Whether the camera app will play along has to be proven. And don’t forget that the autofocus of a smartphone works differently than the autofocus of a DSLR. The smartphone has no cross-field sensors. It will be exciting to see how that is implemented in software. Let’s come to the zoom ring. Here I’m not so sure if it’s a curse or blessing. A zoom ring is much easier to handle than swiping on the display. Now smartphones unfortunately doesn’t have optical zooms. The LG with its two focal lengths is making an exception here, so the zoom ring on the CAM Plus makes sense. The zoom ring could therefore unfortunately cause frequently use of the the digital zoom. A nightmare for each ambitious photographer. The digital zoom is ultimately nothing more than a cropped picture, which is then is blown up. This is very suboptimal. Well, as long as you look at the images only on the smartphone it’s even. The zoom ring is also switches the camera from back camera to front and vice versa. For people who like selfies certainly a handy feature. Two other rotary wheels complete the picture then. One is responsible for the exposure (finally) and the other seems to be relatively free to configure. From the pure operation of the handle the Pictar probably comes very close to a good compact camera. A non-electrified shoe mount is located on the handle and a ¼ “tripod may not be missing. Thus we see that Pictar is very superior about the possibilities to the CAM Plus module of LG far. Unfortunately Pictar is only available for iPhone. Here, interestingly, are supported all 4p, 5 and 6 Series models. This is achieved by the loading bay can be pulled down. Only the 6Plus and 6S Plus are too large. And Android? Unfortunately not supported. Booo. But somehow understandable. The variety of devices and operating system versions for Android are considerably higher, which would make the development more complex. 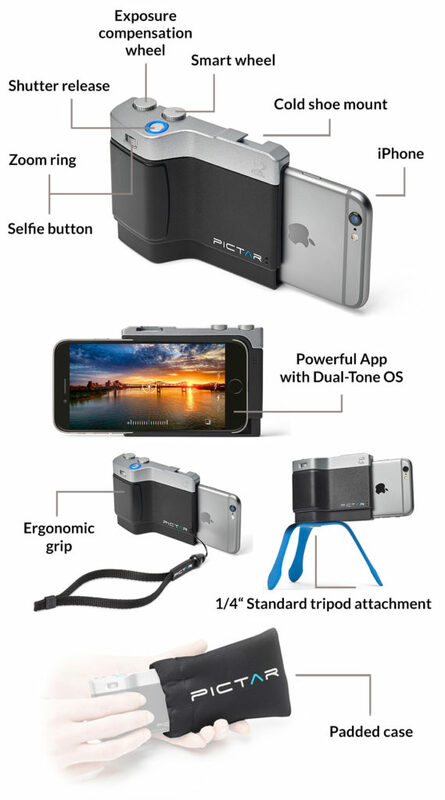 I wonder already at the different iPhone versions, how Pictar will hold the phones tight and safe When the phone is just slide in and then clamped by the bottom of the handle, I would think twice if I would use the hand strap. The fear that the iPhone simply slips at a slightly stronger hand moving downward from the grip to the ground, is too large. In order to accommodate the different sizes there is no plug, which would still provide some support in the handle. Such a connector would have been also not bad. So miggo could have spended the handle a spare battery like the CAM Plus. The communication between the handle and smartphone has to be wirelessly. Interestingly, Pictar is not communicating via Bluetooth with the iPhone but using tones. That is more economical that using Bluetooth, so that a CR ½ AA could last 4 to 6 months. But I personally would prefer a rechargeable battery. The Pictar grip looks very well. And if now the makers can convince me that the phone is really safe sitting in it, I would say that it is a really cool add-on. I could get over the lack of spare battery. You must not forget that the price of $ 70 for the Early Bird or $ 90 plus the normal pledge is not the world. Maybe worth the risk. The fact that the creators have already held two successful campaigns sounds definitely good. They should know how to handle the campaign. If the grip doesn’t holds your phone tight enough, your phone can fall to the ground.